The Constitution Forever stamp is unveiled at the Charlestown Navy Yard, August 18, 2012. Photo by Greg M. Cooper. Despite her iconic status, Constitution has surprisingly graced only one other stamp in her 215-year history. For decades, many individuals and patriotic organizations solicited the Postal Service and members of Congress to issue a USS Constitution stamp. 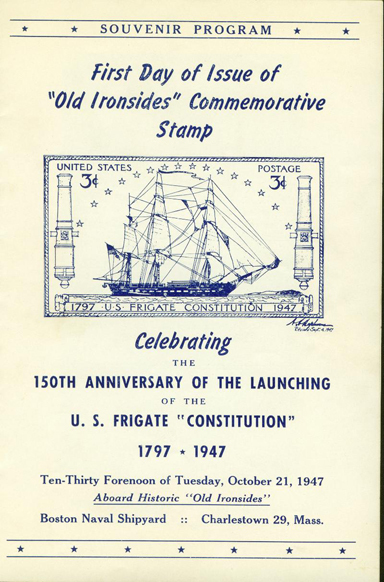 On September 15, 1947, the Post Office Department officially announced that it would issue a 3-cent Constitution stamp on October 21 on board “Old Ironsides” to commemorate the 150th anniversary of her launch. 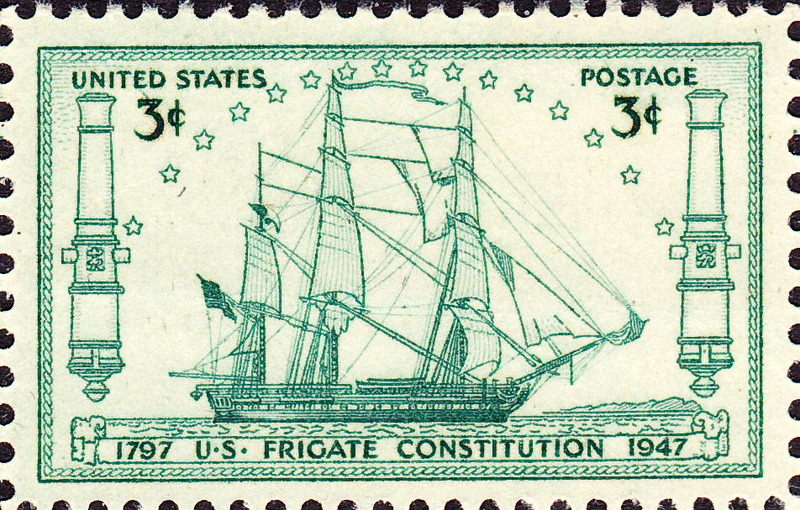 The approved stamp was the work of a local architect named Andrew Hepburn, who used ship models, plans, and original sources for his design: USS Constitution shown starboard-side sailing with a light breeze, flanked by two cannon, under an arch of sixteen stars representing the sixteen states of America at the time of the ship’s launch in 1797. Program from the First-Day-of-Issue ceremonies, October 21, 1947. 3-cent Constitution stamp, issued to commemorate the 150th anniversary of the ship’s launch. Although she’s only appeared on two stamps, Constitution has nevertheless had a longstanding reputation in the philatelic world. In 1931, Constitution and a crew of 81 sailors, officers, and Marines set off on a three-year, three-coast tour of the United States. This goodwill mission was a public thank you to the men, women, and children, who, from 1925-1931, raised a phenomenal $985,000 to help restore the ailing vessel. With 70 stops along the East, Gulf, and West coasts over three years, the National Cruise sent the philatelic world into an uproar. 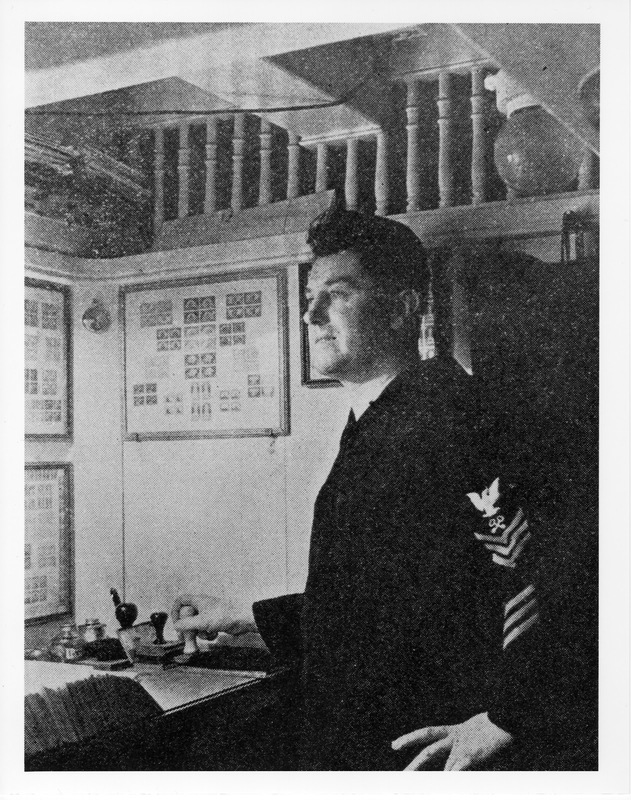 Thousands of individuals, collectors, and dealers created cachets commemorating Constitution’s voyage and brought or sent them to the Ship to be canceled by Harry Moore, the Naval Postal Clerk assigned to the voyage in August 1931. By the end of the first year alone, Moore estimated that he had canceled half a million cachets and letters! USS Constitution, 1931. USS Constitution Museum collection. 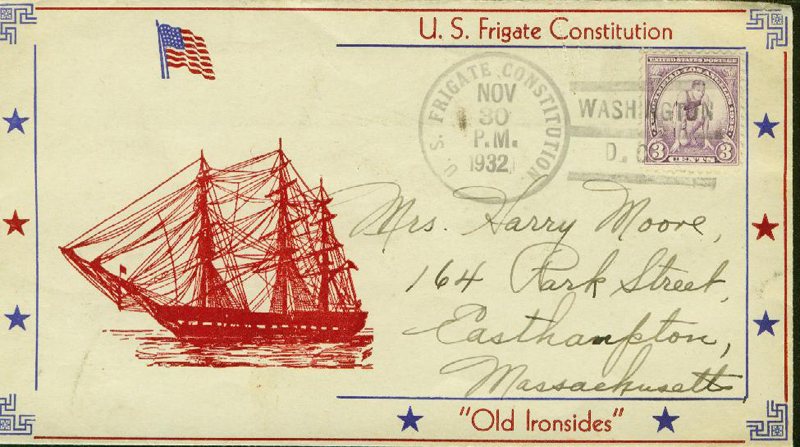 Cachet addressed to Harry Moore, canceled on board USS Constitution November 30, 1932. USS Constitution Museum collection. If you missed the official first-day ceremonies at the Charlestown Navy Yard, there’s still time to buy Constitution Forever stamps, and to receive a First-Day-of-Issue Postmark. Now go write your mother. Louis J. Gulliver to H.S. Groat, 19 December 1933. Ship’s Papers, 1931-1934. Samuel Eliot Morison Memorial Library, USS Constitution Museum.